Benjamin, a double-bassist, was born in Cooperstown, New York, in 1980 and grew up in Pennsylvania and Colorado. While in high school he studied with David Potter, and spent two summers studying with Stuart Sankey at the Aspen Music Festival. Benjamin is an active chamber music performer and has collaborated with various artists including soprano Dawn Upshaw, The Borromeo String Quartet, The Hawthorne String Quartet, Collage New Music and Boston Musica Viva. In 2002, while a fellow at the Tanglewood Music Center, Benjamin was the recipient of the Maurice Schwartz Prize and was reviewed in the New York Times for his performance of Jacob Druckman’s “Valentine” for solo double-bass. 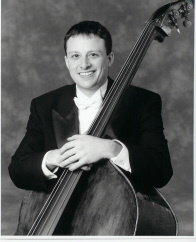 A recent graduate of New England Conservatory and recipient of the Chadwick Medal, Benjamin joined the bass section of the Boston Symphony Orchestra at the start of the 2003 Tanglewood Season and in the fall of 2007 will assume the Boston Symphony Orchestra’s third chair double-bass position. Currently on faculty at The Boston Conservatory, Benjamin’s teachers have included David Potter, Todd Seeber, Timothy Pitts, Paul Ellison, and Stuart Sankey.